The wonderful New York writer John Osterhoudt wrote a column in 1976 – probably for Gater – in which he described watching a race at a venue he inaccurately described as “the old Devils Bowl Speedway in Fair Haven” [Vermont]. I know that John was referring to the Fairmont Speedway, C.J. Richards’ first promotion and the origination point for the Champlain Valley Racing Association [CVRA] sanctioning body which operates Devil’s Bowl and Albany-Saratoga today. Osterhoudt had apparently followed Steve Danish out of New York to Fairmont. This was way out of Steve’s usual stomping grounds of Fonda and Victoria. I would have to assume the year was 1965, although it may have been 1964. C.J. Richards was featuring a late – season long distance feature race, and he would attract a few stars not usually appearing at Fairmont, whose competition level was improving, year – by – year. Even given this improvement, the CVRA regulars were still not much of a match for the top notch NASCAR sportsman coupes of that era. Jean Guy Chartrand in a later version of his famous 901’s. One of the invaders there that afternoon to join Danish was Jean – Guy Chartrand, of Montreal, Canada, who was still driving his #901 Chevy coupe. [He had not yet graduated to Ed Cloce’s legendary “hemi cuda”. Chartrand’s gold and tan 1937 Chevy and Danish’s familiar cream – colored #61 would be the class of the field, although regulars like Mert “Socks” Hulbert, driving one of the Fred Searing cars out of Oak Hills, New York were poised to give the carpetbaggers a run for their money. The CVRA ranks would include Vince Quenneville,Sr. of Whiting, VT, driving the Gael Dundon #3; Roger Gauthier of Fort Edward, NY, driving the Charles Habreck #53; Johnny Richmond of Peacedale, RI, with his #93; Russ Shaw of Bomoseen, VT, with the Norm Scarborough #24; and many more potential feature winners who didn’t want to see the invaders take their loot. 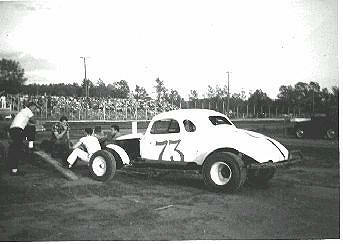 Mert Hulbert [white shirt] sits on the front bumper of his sportsman and awaits the start of the program at the old Fairmont Speedway in 1965. The show ran through its usual cycle of qualifying heats and the crowd got to see a great Hobby Class race that afternoon. That division had a few future stars of its own: Tim Baker, who would go on to star at Devil’s Bowl with the 04 late models; “The Unbeatable Lennie Wood”, whose F-30 Chevrolet did seldom lose; Chuck Ely, of Lebanon Valley notoriety; Graham Trudo, whose 1949 Ford creation was more modified than hobby car; and future prima car builder Dex Dorr – to name just a few. Their features always ended with Wood ahead until the radical Trudo car appeared on the scene. But, considering Lennie’s car was more within the boundaries of what was understood to be a hobby car, he could be excused for finishing second after Graham’s arrival. A very young C.J. Richards presents the trophy to Steve Danish after his last – ditch victory at Fairmont. I can only add to John’s writing that I was lucky enough to be there that afternoon. I always thought it was Steve last win, but his son, John feels strongly that it was not. I do know this – there was no one in the early years of racing anything like Steve Danish. He pioneered the sport in many ways. He was one of the first to effectively use a sponsor; he insisted on immaculate uniforms for his crew; his shop was spotless; he worked out in preparation for each season; and he sort of developed tear-offs [using Saran wrap on his windshield as early as 1960]. If these don’t seem like a big deal – consider I am talking about most of these things being done in the middle 1950’s – not today. In this trophy presentation at Fonda, around 1983, this man and his son figure they died and went to heaven, standing in Victory Lane with Steve Danish. Danish was a hero of mine, and one of the thrills of my life was to finally meet him in 1985, and to go up in his small airplane with him – thanks to his daughter and son – in –law, Stephanie and Phil Miller. He began racing around 1949 or 1950; and he was not exactly a teenager then. It is positively amazing that he was still running successfully in 1964. And then, consider that he ran a six cylinder powerplant against V-8’s. Steve’s cars virtually remained the same, graphically, for that entire time. Image for the “Danish Chevrolet” was everything to Steve, and he nurtured that image consistently and unyieldingly until the day he hung up his helmet. Apparently, Richards featured a few “all star races” at Fairmont in the mid 1960’s. Held at the end of a season, he would offer some pretty good money and manage to attract several big NASCAR names from the Northeast to show up. This was probably the situation when Danish beat the field that afternoon. In historical photos he used to feature in his earlier Devil’s Bowl programs, C.J. shows some pretty impressive lineups at Fairmont. They almost look as though they could be under the lights, although late in the season usually meant Sunday afternoons up here – where the nights ain’t much fun in the Fall. This photo of an all star race at Vergennes is my particular favorite. It has a rare shot of the Lee and Royce Tucker 14VT, as well as Black Jack DuBrul, from Shelburne, Vermont [the tall guy in the middle]. Lately, people having been coming out of the woodwork to help me preserve as much local racing history as we can. Obviously, it takes a group effort, as I only have what few pictures I took in my life, and I only can relate facts and stories that I have experienced or been told. So, when people come forward with a packet of photos to scan – or some stories about some long – closed speedway, it is of immeasurable help. I have had the pleasure of making the acquaintance of one Ed Fabian, from West Rutland, Vermont. Ed and I got connected through someone who was looking at my website. He saw what I had to say about the long – forgotten Pico Raceway, which was outside Rutland, Vermont. He became very interested in the track that he had helped his father to build in 1952. Ed Fabian stands in the middle of the inside of Turn Three and tries to visualize the track he helped shape in 1952. Ed has taken it upon himself to almost single-handedly preserve the history of Pico. He has shared photos, lined up interviews with former drivers from that era. I have subsequently referred to Ed as the Guardian Angel of Pico Raceway. He even took me up the former site and we found a small portion of the track that survived the massive landscaping when General Electric built a plant on the site in the 1960’s. We actually found the banking near turns three and four, and compared the present trees to ones seen behind a picture of Al Romano driving through those turns in 1952. Most likely, the contoured area really was part of the track. That is a major discovery for a track long thought to be totally obliterated. In the near future, Ed has arranged for former drivers such as Bill Anderson, Jerry King, and maybe Al Romano to hold discussions with me about those long – past days which formed our sport in Vermont. We need more people to step forward and take an active part. Getting the history of the stock car racing in the Northeast together is a great collaboration – or it won’t get done. Although I try to concentrate on the history of Vermont racing as an avocation, New York stock car racing in the Golden Era, the late 1950’s and most of the 1960’s, is still one of my major fascinations. One of the most interesting figures in that era was car owner Frank Trinkhaus, from the unlikely – sounding hamlet of Fly Creek, New York [not far from Cooperstown]. The Frank’s Speed Shop #62 must have set some sort of racing record for having the most paid drivers in one lifespan of a racing team. Frank, himself, first wanted to run his own equipment in the 1950’s. But, soon, he cast about for someone else to climb through the window and he settled on two early chauffeurs: Joe Ciganenko, local to Frank’s area, and Lee Armstrong. These were the first two real Trinkhaus drivers. After those two early drivers, Frank went on a pattern of almost having a different driver every single season. He concentrated mostly on Fonda, but I believe he did run Victoria Speedway, in Duanesburg, NY, as well. 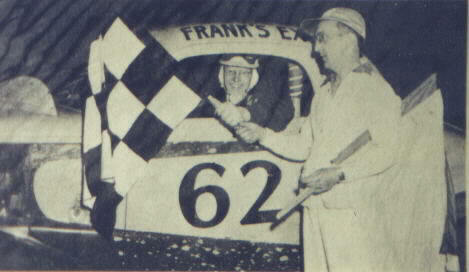 [Left] Joe Ciganenko wins a race for Frank. Early on, the familiar paint and number scheme is in place. [Right] Lee Armstrong may have been the earliest driver, as we see an older graphics scheme. Popular Howard “Little Jeep” Herbert became a frequent flyer in the Trinkhaus coupe. Jeep spent at least parts of two or three seasons running for Frank. The first time I got to see Fonda, around 1962, Jeep was in the 111a of Chris Drellos. But, the next year, he was in the #62. It is hard to find people who didn’t try out the seat of the Frank’s Speed Shop car from Fly Creek. Steve Danish had a brief stint in the car. He chose the right time. 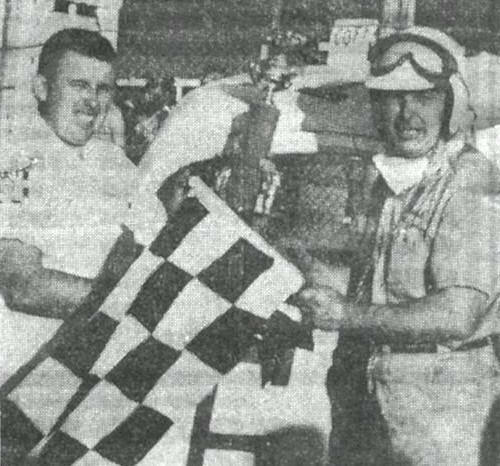 He won the feature that night and got to have his trophy presented by Miss America. Pete Corey drove the car; Kenny Shoemaker drove it, and so probably, too did Ernie Gahan. When I think of the Trinkhaus car, I think of Jeep Herbert. Here, he has won a race at Fonda – no easy feat. Some of Frank’s regulars included the ultimate driver – for – hire, Donny Wayman of Cobleskill. I don’t know what car Wayman failed to try in his career. Clearly, he didn’t relish ownership. He drove the 62 in the classic, upright setup days and then later when they began to lower the bodies and use more technology. Lee Millington, of Palatine Bridge, drive Frank’s most modern and potent car. Low – slung and fuel – injected, the car Lee piloted was Frank’s best. But, when Pee Wee Griffin was horribly burned in an accident that was no one’s fault – especially Lee’s – Trinkhaus no longer would have the racing taste in his mouth any more. Irv Taylor sits in the pits while the 62 is serviced. I have no clue why Frank had the roll cage above the roof. He never did any other year. Another of the highly – thought – of pilots to sit in a #62 was Irv Taylor, of Rexford. Taylor, a huge, Hoss Cartwright – sized man, was impressive enough to be considered in the circle of men Pete Corey actually admired. He drove the 62 to at least one Fonda feature win. 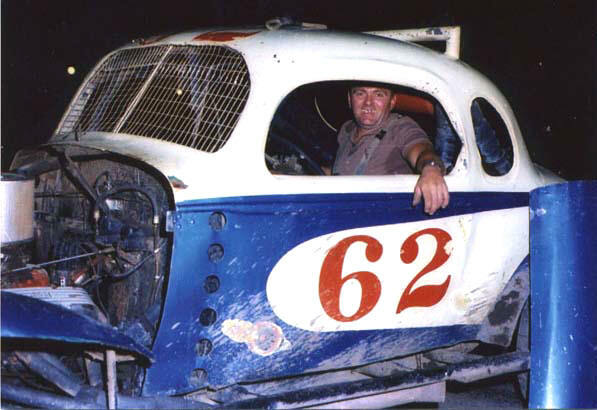 The most tragic driver for the 62 team was Munnsville, New York’s Lou Smith. Smith had come from the wheel of a beautiful red 1937 Chevy to drive for Frank, an owner he had always admired. Smith was killed in a rather freakish accident in 1965, through no fault of anyone’s. Just bad racing karma. I don’t think anyone is any better or more fondly remembered than Frank Trinkhaus. We now hope to be able to have some local historian acquire access to any documents, photos, or other memorabilia Frank may have left behind. As I mentioned before – once it’s gone – it’s gone forever.